Since 1912, The College of St. Scholastica has been preparing students for a life of purpose, in addition to economic gain, by emphasizing the Catholic Benedictine values it was founded on. St. Scholastica is an independent private college with locations across Minnesota, including our original campus in Duluth. Enrollment in our undergraduate and graduate programs has grown from 2,200 to 4,000 in the last decade, due, in part, to our commitment to making high-quality education available online and through convenient evening and weekend formats. The College is accredited by The Higher Learning Commission and is a member of the North Central Association. 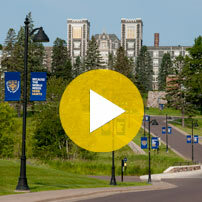 The Duluth campus is also home to the St. Scholastica Monastery and the Benedictine Living Community of Duluth.